← John Menadue. Cars are killing our cities. Time for policy rethink as frequent GP attenders account for 41% of costs. The Commonwealth government’s big idea for primary health care in the past year was to charge everyone who visits the GP a A$7 co-payment. The idea had many problems – it could have led to a blowout in emergency department demand; it was inequitable; and itmay not have worked anyway. It has finally been abandoned. The failed policy betrayed a simplistic belief that all patients are basically the same. The government thought all patients should make a co-payment and all would respond to it in the same way. Eventually, the government decided to exempt some people, but even then, patients were only divided into two categories. People who did not attend a GP at all in 2012-13. The very high attender group comprises just 3.8% of the population but consumed 17.7% of Medicare out-of-hospital expenditure (see the graph below). On average, each of these very high GP attenders accounted for A$3,202 of non-hospital Medicare expenditure in 2012-13, compared to an Australian average of A$690. By grouping together the very high and frequent attenders, we see that 12.5% of the population were responsible for 41% of Medicare out-of-hospital expenditure. A conventional measure of quality is care continuity – that a patient sees the same doctor regularly rather than shopping around. Very high GP-attenders saw an average of 4.8 GPs in 2012-13. More than one-third of them (36%) saw five or more GPs. Seeing so many different GPs can lead to duplicated tests and treatments, which might help to explain why the frequent GP visitors got so many tests and referrals to specialists. On average, referrals to specialists, x-rays and pathology tests by these people were almost 50% higher than their spending on GPs. 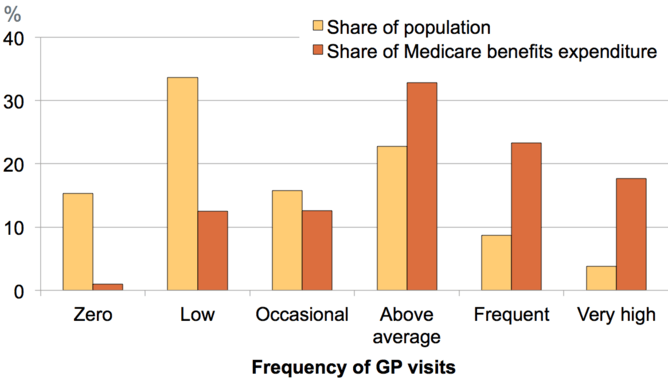 Frequent GP visitors spent A$906 on GPs per head, and A$1356 on other services. What does this mean for health policy? The National Health Performance Authority report clearly shows why one-size-fits-all thinking in health care policy development isn’t good enough. People who see the GP most often tend to have more health problems than low-attenders and a greater level of disadvantage. But the original A$7 co-payment policy applied the same set of incentives to both groups. The A$5 rebate reduction was barely more nuanced. The next generation of health policies should respond to complexity and diversity, not pretend it doesn’t exist. Does the system work for all kinds of patients? Which patients are getting costly care that doesn’t benefit them? By asking these questions, we can uncover how to improve the quality of care while also saving money. People who see the GP every two weeks probably need better co-ordination of their care. They might also need a different team of health care workers helping them. For many frequent GP visitors, the traditional model of paying doctors a fixed fee per visit isprobably wrong. Instead, part of a GP’s payment should be for helping a patient draw on the right mix of appropriate, effective and efficient care. That might include support to manage their own care better, getting regular advice from a pharmacist or nurse at short notice, maybe online, and seeing the GP less often. Differentiating among types of patients can lead to better policy. So can distinguishing among types of providers. Previous Grattan Institute work has found that some hospitals have extreme, unjustified costs. Despite this, little is done to rein in these costs – hospitals that run a deficit are often treated much the same as those that manage their costs well. The funding and management of hospitals remains fairly one-size-fits all, despite huge variations in efficiency. Our upcoming work will show that different hospitals also vary widely in whether or not they provide ineffective treatments. Once again, we can do a lot more to distinguish the best hospitals from those that have serious problems and to manage them differently. The National Health Performance Authority report is a reminder that we have more information than ever about patients, just as we do about providers and treatments. We should make the most of it by looking at how these patients, providers and treatments differ and what that means for policy. Stephen Duckett is Director, Health Program at Grattan Institute. This article appeared in today’s The Conversation. This entry was posted in Health and tagged chronic care, GP remuneration, Grattan Institute, Stephen Duckett, The Conversation. Bookmark the permalink. One Response to Stephen Duckett. Frequent flyers in health and the way we remunerate doctors. Very enlightening & as an ex GP, not so surprising. Here’s hoping that the current Fed. minister for Health is a more analytical thinker than the last.